Would you like to make a difference on abroad? If you are one of those who like to try new and local things during journey then we highly recommend you join a cooking class in Barcelona city. By this activity, you grab the chance to learn the points of cooking traditional food and pass the time in joy. When we talk about local food in Barcelona lots of options come to mind such as Paella, tapas,sangria and many other traditional food also. In cooking classes, it will be fun to meet other people on holiday and coming together for a specific goal may make you feel great. Of course you can try all these traditional food in restaurants but when you come back won't you desire to cook for your lovings? Whenever you cook Spanish style food you will call the memories back and live those times every time. In Barcelona Travel try to make the best of journey if you have time. 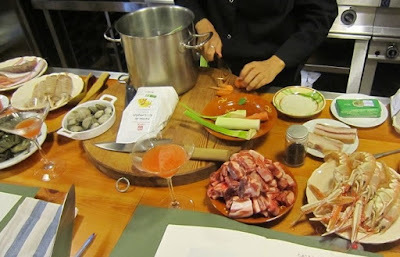 So cooking classes in La Rambla can be a good alternative. Coming together with new and adventurer people at a lunch and drinking something nearby the window having a scenery to La Rambla street. Don't forget to visit the bazaar below before your cooking class. It's a chance to experience the culture in a different way. Here below you can find the web sites and choose appropriate cooking class during your holiday.